Before I get into the thick of this article, I just want to say that this is only sort of a critique. 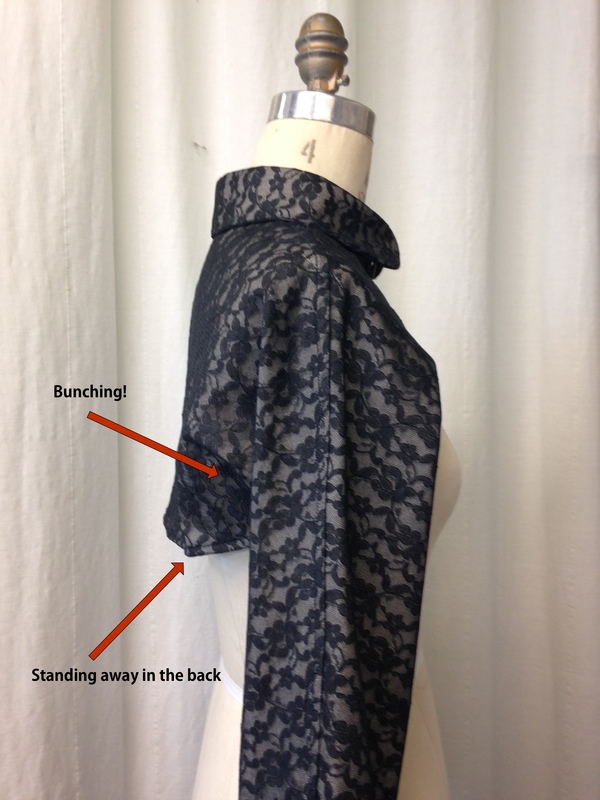 Yes, the stylist for Butterick really altered the final look of the shrug, and it’s certainly a false representation as to what the stitcher’s final product will be if said stitcher follows the pattern and instructions in the envelope to a T. However, the end product was wearable, even if it did need somewhat extensive re-fitting and restyling. With a little thought and resourcefulness, I was able to salvage the shrug. If anything, costumers and cosplayers alike are super inventive and resourceful, right? And maybe this article might help to inspire someone to finish a costume’s that stuck in stasis in the back of the closet! The pattern in question… I am not sure what part of history this is from, however. Just for some information, I made the style ‘E’ shrug from the Butterick B5797 Making History pattern, in size 12. 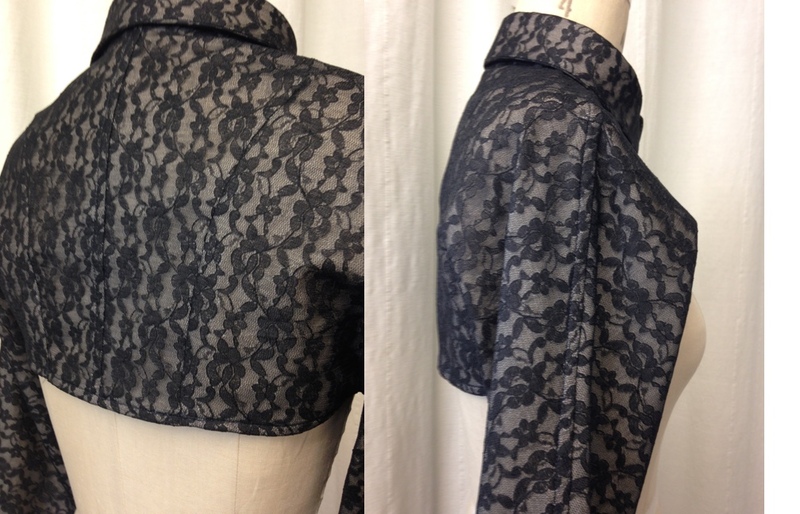 I used black poly lace as the fashion fabric, and I lined the garment in washed muslin, so I could easily launder it. I sweat, so no sheer, see-through fabrics for me! In fact, my super powers probably lie in my propensity for underarm perspiration, so there was no way I wasn’t lining it with something. Besides, the recommended fabrics were woven, so it wouldn’t make too much of a difference. The issue was with the pattern itself. 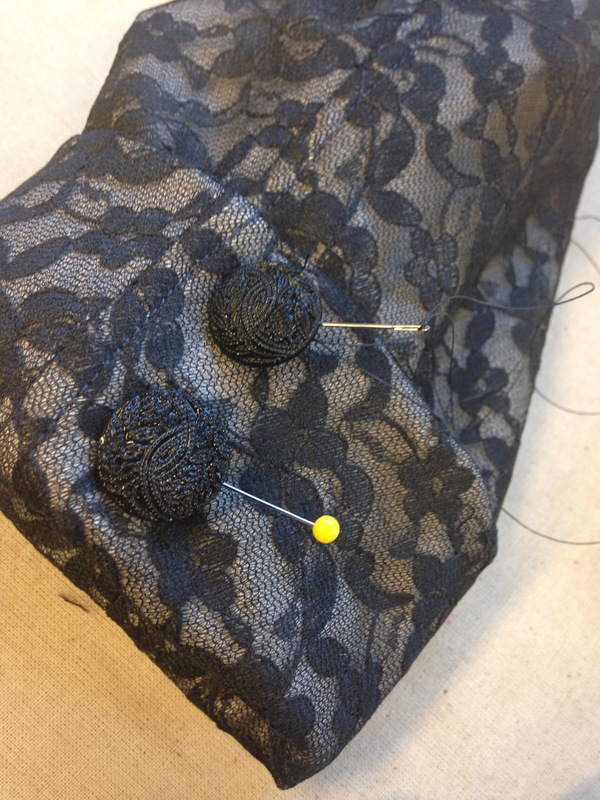 The fabrics recommended for E on the pattern envelope are things like lace (check! 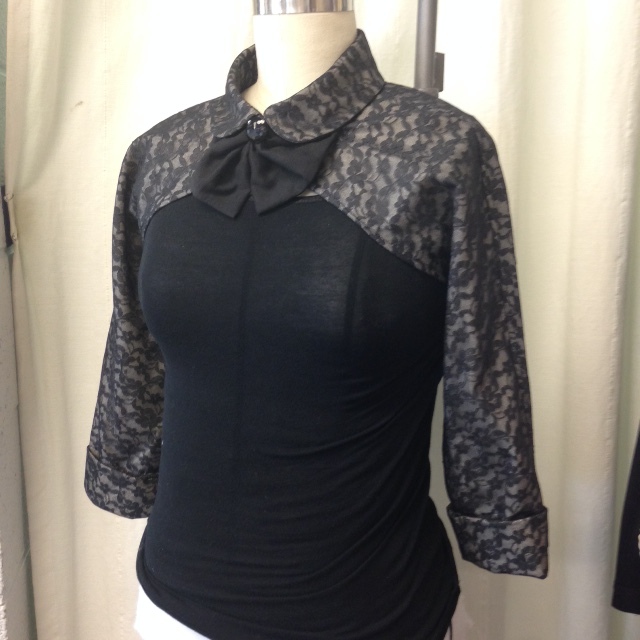 ), chiffon and/or organza. I honestly can’t imagine this shrug in chiffon or organza. Firstly, chiffon is a pain the patootie to work with, and it would have been the saddest, saggiest little thing I ever did sew. Secondly, organza is stiffer than chiffon, but is still sheer. I don’t think that this particular shrug would look good in organza, with consideration to its strange fit and the general handle of a material like organza. Thirdly, there is an image available on the Butterick website (see link above), showing the shrug made in… pleather? Really cheap-looking pleather. It’s quite unattractive, and the shiny stiffness of the material simply showcases what’s wrong with the pattern and fit, although it’s a more accurate representation of what the final product will look like, if one follows the pattern and directions to a T.
My fabrics: Lace and muslin. 1. I just cut the pattern out as-is. No alterations, I simply followed the sizing chart on the envelope and cut my fabric out with the assigned pattern pieces. 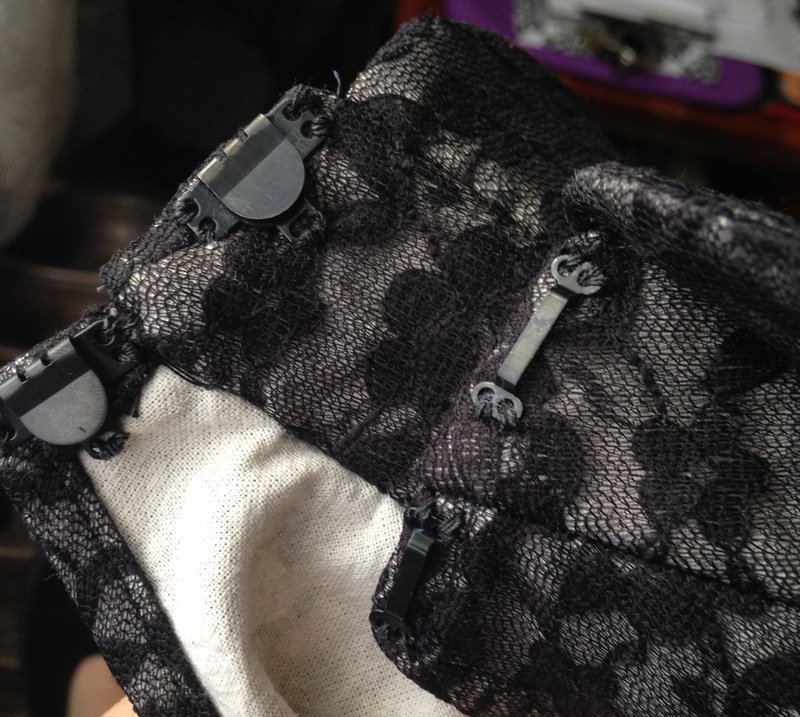 I did flatline my lace in cotton, which simply means that I cut the lace and the muslin out together, as one piece, and stitched them together all around the separate cut fabric pieces. 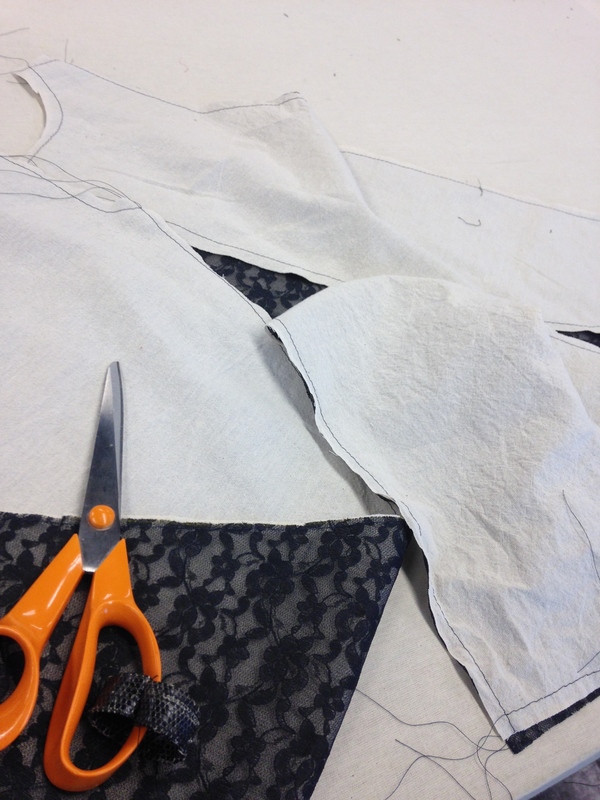 I cut the pieces out, laying the lace and the muslin together as a single piece, then stay-stitched all around the edges of the individual pieces. 2. I sewed the garment together, again following the instructions provided in the envelope, although I chose to finish my seams by flat felling them, instead of the weird, double-stitch thing that Butterick recommends. 3. 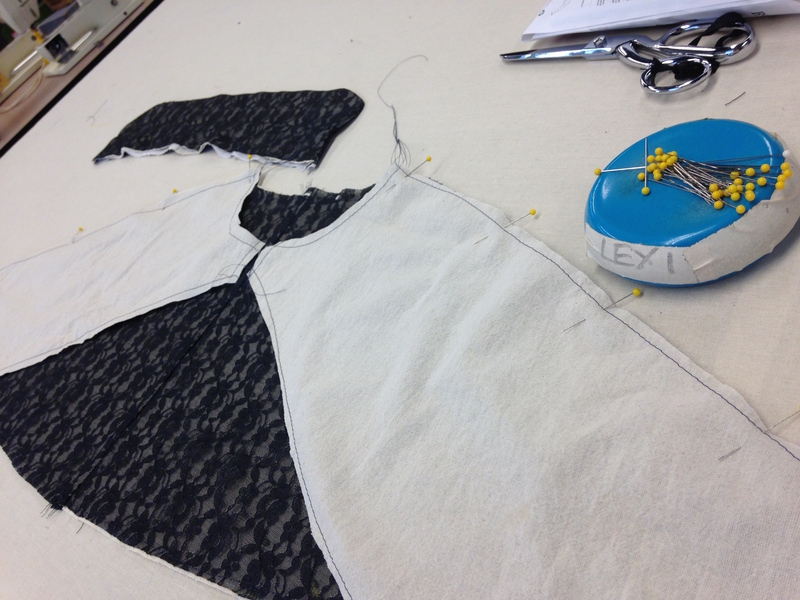 Before I did any finishing, I fit the garment, utilizing a dress form that is close to my body measurements. People really can’t properly fit garments on their bodies, and, since it was weird on the BACK of the shrug, I definitely couldn’t fit it on me. You can see that the fabric is bunching under the arms and standing away from the dress form in the back— not a pleasing look at all. 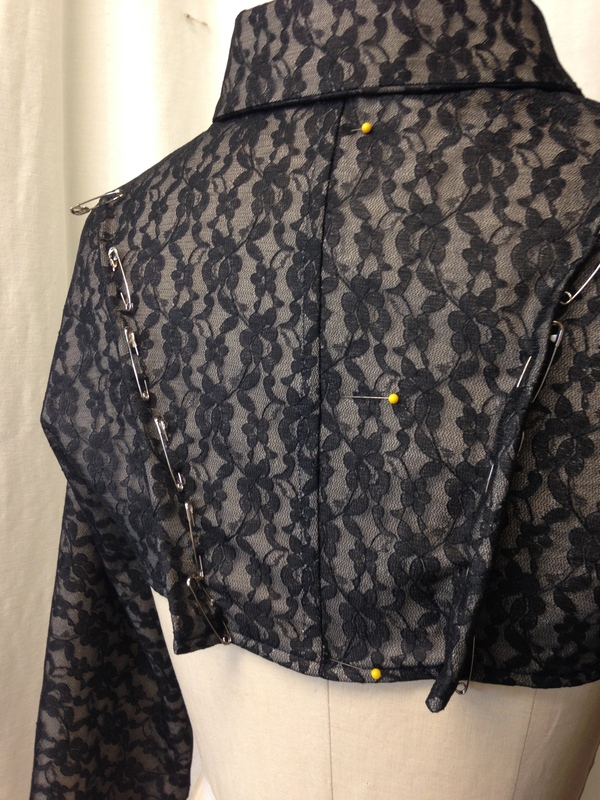 To combat this, I added some curved darts to the streamline the back of the shrug. Additionally, the sleeves were also really large circumference-wise, as opposed to the image of the lace shrug on the front of the pattern envelope. They were more like suit-sized sleeves than narrow sleeves, and they absolutely were not what I was expecting. 4. I had already started to finish the garment by means of turning the edges of the hem and topstitching them, as there was no lining, and it was the recommended method in the instructions. The darts certainly helped the profile of the garment when all was said and done. 5. I decided to forgo the bulky necktie detail at the collar, since the collar band was already fitting a little oddly (it stood pretty far away from my actual neck), and I wanted to eliminate some of the amount of fabric that was already convening at the area of my throat. I opted for skirt hooks and bars, although hooks and eyes would have been sufficient, if that’s what you have. I used two skirt hooks and bars, but you’ll probably want to use at least three hooks and eyes, since they’re frequently a little smaller. 6. 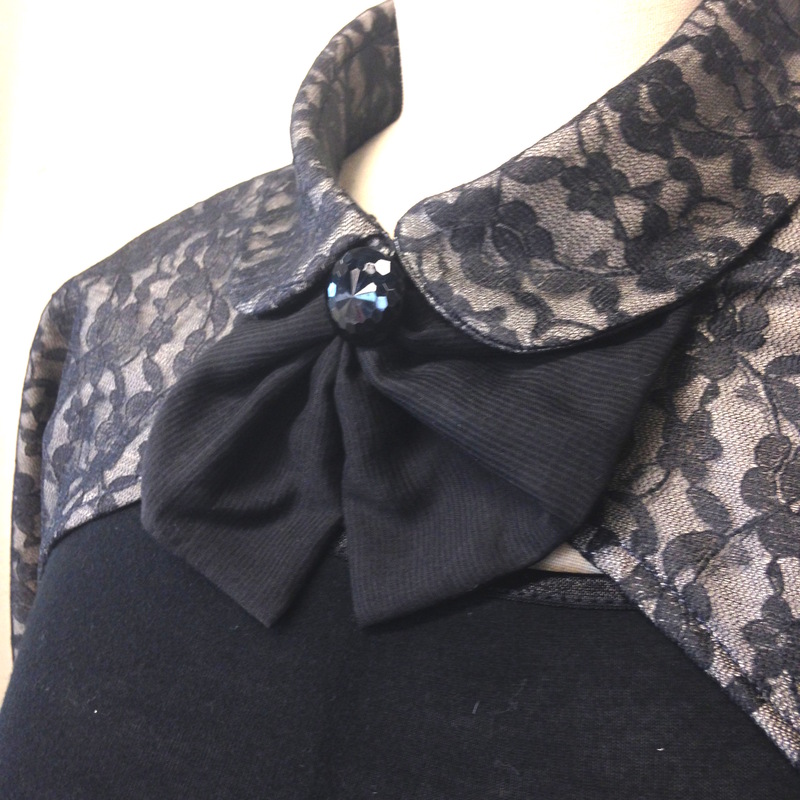 I still added a neck detail, but made the floppy little bow detachable, so I could wash the garment and maybe make some different options for neckwear in the future. 7. So, the sleeves. As I mentioned, the sleeves were a real disappointment, but not entirely unsalvageable. I played around with the length and decided to cuff the ends at a 3/4 length and added some decorative little buttons. Cuffs and buttons– feel free to add more detail when possible and appropriate. 8. Voilà! The shrug is completed, wearable, although not really resembling the product in the photo, which is really what caught my eye to begin with. The end product is also very snug across the back of my shoulders, but there’s little to do about that at this point in the game. Not what I anticipated, but it’ll do just fine. Just remember: Don’t give up, be inventive, and consider if it really makes a difference if your costume or garment really needs to look precisely like the original image (100% copying of an image into a costume is, like, not really a possibility, no matter how good the stitcher is!). Next, I might give the corset-style top a try next, just for the heck of it. What are your adventures in sewing, readers? Have a costume you’re proud of? Have any sewing questions? If so, leave a comment below! Thank you for this! I am making a shrug from my own pattern based on tutorials I saw online. It’s worked out great, except for that same bunching under and behind the arms. I Googled like crazy to figure out how to dart it correctly to fix that, and thankfully came across your page. Your shrug looks beautiful. Thanks for the posting!